EPK’s- Media Packages available upon request. 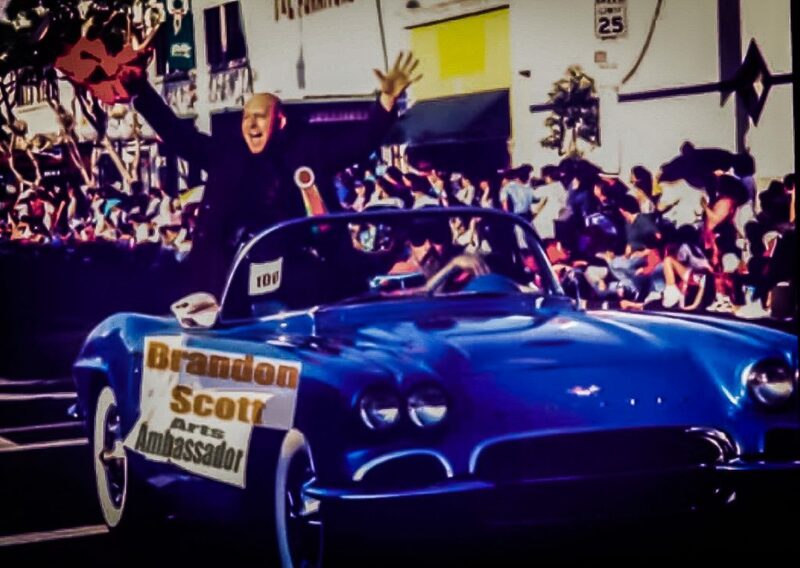 Brandon Scott featured in Los Angeles City holiday parade. It’s Friday night at the Magic Castle, a Victorian mansion perched in the hills above Hollywood Boulevard. Brandon Jay Scott is about to go onstage, where he’ll mesmerize his audience with impossible feats of magic spiked with a good measure of humor. He’s buzzing with energy, but certainly not stage fright ― not after performing on every one of the stages at this mecca for magicians over the last 30 years. His interests and passions are so varied, it’s a wonder he can cover so many bases and still be one human being. 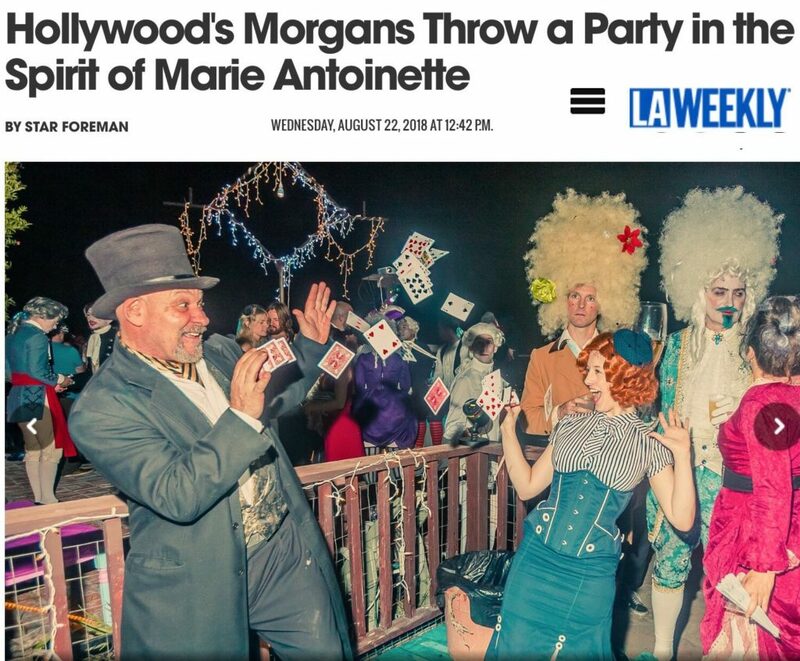 When he’s not at the Magic Castle, he’s the marketing director for NoHoArtsDistrict.com, a comprehensive website that covers all of the arts. He says North Hollywood is exploding with creative talent, with over 23 theaters located in a one-mile radius. Working with Nancy Bianconi, the CEO of NoHo Communications, their vision is for the Noho Arts District to become a “West Coast off-Broadway,” nationally recognized as a performing arts destination. He’s also an accomplished martial artist with the moniker “Master East-West” because of the way he combines the various disciplines. Created by Marsha Scarbrough, the Magic of Martial Arts DVD teaches children about nonviolent conflict resolution. Brandon has also led workshops with L.A.’s BEST after school program and on behalf of the “YMCA’s Week against Violence” which earned him the unofficial title of “Children’s Peace Ambassador.” Other awards include certificates from the city of Los Angeles, signed by Mayor Antonio Villaraigosa, for his work entertaining people in underprivileged areas of the city, at fundraisers and at hospitals. There’s a word to describe someone like him, a Spanish word: duende, a term difficult to translate into English. The original meaning is a fairy- or elf-like creature. In Flamenco the term “tener duende” is loosely translated as having an energetic, charismatic soul. 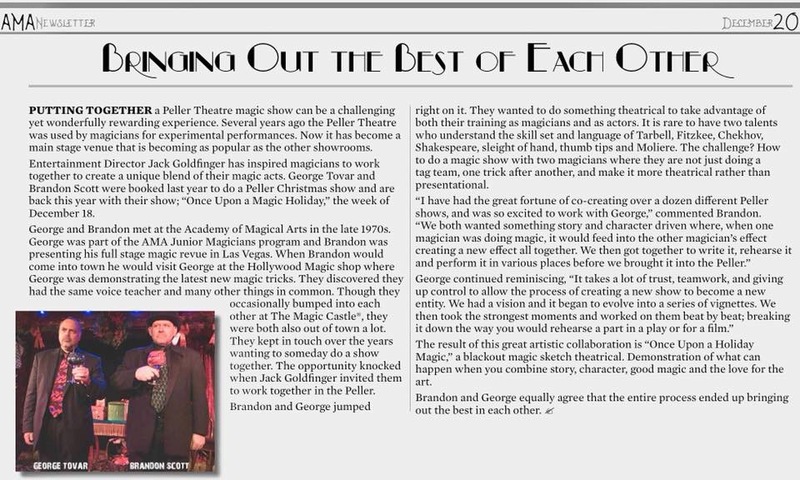 And to think it all started when Brandon received a book on magic for his fourth birthday. He was living in Mexico City with his parents, both English teachers. The Scott’s were active in the Mexican–American cultural scene and knew professional magicians and other entertainers. Some became mentors in Brandon’s early years. Between the book and their help, he was a full-blown magician by his next birthday. Of course, it didn’t hurt that he enjoyed being the kindergarten class clown. Ah yes, girls. That was one of the benefits of being a performer, as Brandon will readily acknowledge. He admits it was once a motivating factor. As he matured, Brandon realized the reason he does what he does is that he loves to entertain the inner child that lives inside us all, whether 8 years old or 80. “Adults are really like grown-up children when it comes to the ‘wow’ and ‘ha-ha-ha,’” he says. Brandon does have his devilish side, however. He enjoys a good practical joke, like when he does a “mystery man” performance at a wedding or exclusive corporate event. He says it’s all very subtle and delivered with a straight face. He recounts how one time some people left early before finding out it was all a put-on. They went to work on Monday thinking they had to sing to the customers when they made a bank deposit. Another time, a company flew in doctors from all over the country to hear Brandon give a speech on medicine, a spoof written by the hospital administrators where Brandon’s character revealed that the secret of all medicine was guacamole. Still, one of his favorite things to do is perform at the Magic Castle. Other favorite stages in Los Angeles include the Ice House, “you’re close to the audience.” He also likes to perform at the Universal Amphitheater because it’s big but still feels intimate. Although he’s produced and starred in shows with multimember casts, at present he works alone. He says it’s solved issues about having to depend on others. His personal life is a solo act as well. He’s never been married, although he says he would like to marry one day. Brandon says he knows his involvement with so many things (a common trait among singulars) is difficult for a romantic partner to handle — unless they happen to be the same way. When asked to name his best performance, he responds there are thousands. “There are few things I enjoy more than bringing a community of people together, especially where I can inspire stressed-out people to feel a moment of joy.